that the pages have splashes of color on them. I love how it is broken down into days so you aren't overwhelmed at all of the life-changing information that this book contains. I like how she reminds us of Jesus throughout the book, like when she is asking you why you don't get enough sleep, she then reminds us that Jesus slept during a storm. I love how she weaves her story in and out of the book along with the advice she is giving you about handling your stress in a more holistic manner. I think that this book would be a great book to have along with a journal to use every few months to see how far you have come using her advice during the 40 days. I received this book from the publisher but all thoughts are my own. This is such a beautiful bible, I have the green and gold version. The gold is stunning and makes the perfect bible to leave out on the table! The paper is thicker than a regular bible making it perfect to journal on. The text is easy to read considering its not a large print bible with the 9 point font. 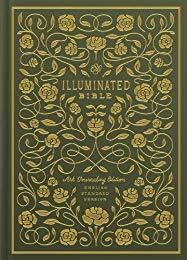 The 250 hand-lettered verses and the illustrations are incredible in the gold designs. It is the English Standard Version which is an amazing translation of the bible. I love this bible, I would recommend it to anyone! I received this from the publishers but all thoughts are my own. I Love how she asks and invites you to taste faith. It helps you on a different level of experience and understanding. I needed nourishment in my soul that I didn't even understand until reading This book. She shares to help you understand how good God is in our lives in a way you can understand. I love how she has included recipes throw out the Book. I Love to bake bread and that was my favorite Chapter in the whole book. This book is wonderful. I would recommend it to anyone that loves to cook. I received this book from the publishers.